On April 1, 1955 the Federal Department of Northern Affairs and National Resources implemented a unified system for school administration in the Northwest Territories. At that point the north had a mix of Roman Catholic and Anglican day and residential schools, mine company schools, Indian Affairs Branch schools, Northwest Territories Council schools, and, local schools run by school boards. All schools, except those run by municipalities, were brought under the umbrella administration of the Federal government and all teachers became government employees. During the 1954-55 school year there were, in the Northwest Territories 2,067 students in 76 classrooms supervised by 92 teachers. The Federal government established minimum standards for teachers in line with those for southern jurisdictions, and many northern teachers were found to be under qualified and lost their jobs. A Canada-wide teacher recruiting drive was undertaken and teachers looking for northern experience quickly filled many of these positions. Many northern residential schools were, by the mid-1950s, in a state of disrepair. The system had run for many years on very little funding and the buildings were old and run down. When the Federal government took over responsibility for residential schools they immediately began a program of expansion and replacement. They implemented a 5-year plan that would see the eventual closure of these old schools and residences. In their place large, modern schools were built in Inuvik, Fort McPherson, Fort Simpson, Fort Smith and Yellowknife (see map)that would serve both students who lived in the community and students from smaller communities. To house these out-of-town students construction began on large students residences adjacent to the day schools. Educators felt that having a mix of day students and residential students in the same classes would give the best all-round education for all. The decision was made to call these large residences halls, a term that planners at the time considered to be friendlier. 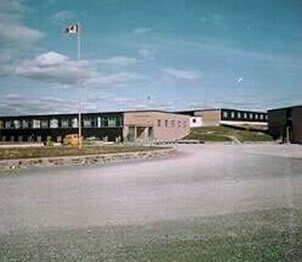 During the later half of the 1950s and into the early 1960s the government built Fleming Hall at Fort McPherson, Bompas Hall and Lapointe Hall at Fort Simpson, Breynat Hall at Fort Smith, Grollier Hall and Stringer Hall in Inuvik, and, Akaitcho Hall in Yellowknife. While the new schools were federally run, the associated student residences were turned over, with the exception of Akaitcho Hall in Yellowknife, to the Roman Catholic and Anglican churches to operate.